Thank you very much for your help and support during the HERACLES dry docking at Whangarei, it was a pleasure to come to New Zealand and work with such nice people as yourselves. We wish everybody the best for the future and look forward to crossing paths again next year. 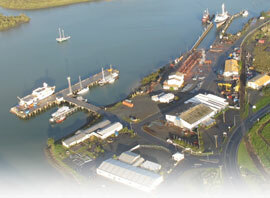 It has been a very good experience to work with Ship Repair NZ. I have seldom found such expertise, precision and promptness in attendance to all the requests we made, and such good collaboration from all concerned. In association with the beauty of the surrounding landscape, your kind collaboration has turned work into a pleasurable experience. All this resulted in a smooth running job without any incidents, in the good and timely solution to all problems we faced specially when opening up the equipment, and in an excellent sea trial. Please forward my deepest gratitude and thanks to all the people in the yard and to all the subcontractors as well. It has been a great opportunity to work with you. Please express our gratitude to your staff and contractors for their efforts and labours on the Yeo Tide. It was a job well done in a short period of time. Up there with the world class yards and docks. May I say how pleased we were with the level of service and the expertise of the staff during the slipping. You are fortunate indeed to have a wealth of experience in the staff you employ, something which pays dividends when sorting out the inevitable problems and issues which arise during repair and maintenance of a vessel. The process for us was extremely straight forward and the friendly and helpful atmosphere right through your organisation made the whole job painless. Please pass on my thanks to all concerned. Manager Operations – Port Of Tauranga Ltd.
I’m not sure if anyone has passed on to you or your staff our thanks for your help while we were in Whangarei, all the ships staff were very impressed by the professionalism and care taken by the shipyard workers and management during the maintenance program. You have a great bunch of people there who went out of their way to assist us, we greatly appreciate it and will certainly offer our support to any who are looking for an honest and reliable facility. I think we met once or twice along the way whilst Itasca was in your Shipyard. I would like to say what a successful Yard period it turned out to be for the Engineering Dept onboard. With Gary Mitchell leading the fitters they managed to service in excess of 60 assorted valves. The determination of the workshop crew, Gary Mitchell, Raymond, Keith, Dave, Gary, Ross, Dennis, Penny, Graham Glass, Brian, alan, and of course Mr Cheung I was most impressed with from the start. Their sheer determination and hardwork is much appreciated by myself, a Chief Engineer of long standing. This is a BIG THANK YOU to each and every one of them including project Manager Peter who gave a lot of time and effort to the planning and successful completion of the project.